Recently I helped a client purchase a fantastic growth asset in an area that has become a favourite investment hotspot of mine – Seddon. I recall the first time I heard about Seddon. I thought to myself ‘Where is Seddon?’ and the Melways map pointed me to this teeny-tiny suburb wedged between glossy Yarraville and eclectic Footscray. ‘How had I never heard of this suburb?’ I asked myself, and with that, I headed west to explore. Nothing could have prepared me for what I found. I had stumbled across a quaint village offering pretty Victorian properties on wide tree-lined streets, akin to some of the pretty areas found around Hawthorn. These wide streets combined with skinny bluestone laneways that reminded me of Fitzroy and Melbourne’s grungy inner northern patches. Seddon didn’t just surprise me with its Hawthorn and Fitzroy sensibilities – it has a real soul that distinguishes it from both of its neighbours. The cafe strip along Gamon Street encapsulates a vibrant Charles Street and sprawls around the corner down Victoria Street, all the way to Buckley Street in Footscray. Along this doglegged stretch, there are more cafes and restaurants than you’d usually find in a village. When you take into account just how tiny postcode 3011 is, it’s a surprisingly foodie little suburb. From organic food stores to great coffee houses, from incredible gourmet dining options to fabulous bakehouses, Seddon is every foodie’s heaven. 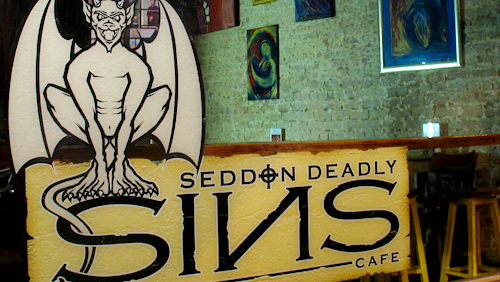 Seddon Deadly Sins, one of the many cafes in the area. The quirks of the area are evident in its overly proportioned blend of pet shops, dog grooming outlets and home-grown gallery stock. And the dog-friendly nature of the suburb is there for all to see on a busy Saturday morning. Residents walk their pooches while diners casually step over leads and water bowls. Rainbow stickers on doors and rainbow doormats greet shoppers and welcome gender diversity; a wonderful reminder of Seddon’s friendly soul. Access into the city is super-easy. There are only four stops between Seddon and Southern Cross, enabling a ten minute train ride. The vistas from many Seddon streets remind residents constantly just how close the city is. There are views across the docks of the city skyscrapers; the ongoing backdrop to this cosy little village. 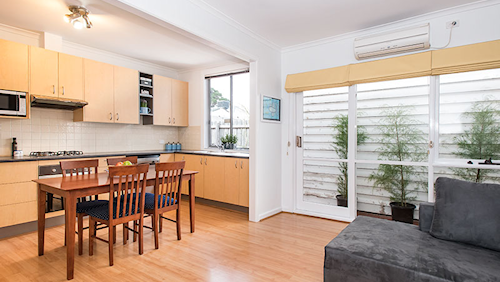 There are four wonderful elements to Seddon which rank it as a hot favourite for me as an investment property advisor. Seddon has gentrified at a rate that could arguably be described as one of Melbourne’s most dramatic. Seddon’s current growth rate for the last five years is tracking above 8 per cent – an interesting achievement when we consider the challenges that have faced our market since the GFC. A single-fronted period property can still be purchased sub-$600,000, which – when you consider other period property prices in a 6km city radius – is a great price tag. 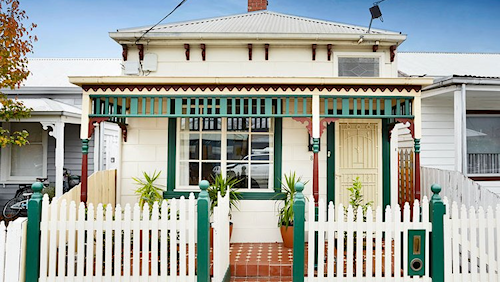 Seddon is quaint, pretty and continues to attract new buyers and eastern suburb migrating buyers! When this gorgeous little property at 80 Pilgrim Street launched an auction campaign, I couldn’t resist putting it forward as a viable option for my investor-client. With a budget that could have yielded a 2 bedroom renovated apartment on the other side of town, I saw an opportunity to take this property off the auction market and secure it for my client. It offered the opportunity for an upgrade and stable rental prospects as it was. It also enabled him to enter an exciting inner-urban house market at an affordable level. I seized the chance, and bought it under competition for $560,000. I challenge anyone to find multiple little hotspots with compelling growth drivers, pretty Victorian architecture, easy access and amenity into town, lifestyle/gastronomical offerings and affordable price tags like this little gem. Seddon is a little force to be reckoned with. Village Life in Yarraville Credit Cycle – Growth is Up and Running Footscray and Surrounds Forecast to Grow Over Next Four Years Enchanting Yarraville What Makes Viewbank Special? I grew up in Seddon and unfortunately the house we bought in O’Farrell street we sold for a pitance by todays standards my parents sold up and moved to Hoppers crossing and we followed.A lot of the people around my mums age moved out down to this area as well. Hi Carol – that is not an unusual story. The inner suburbs were once-upon-a-time the ugly duckling suburbs. My Dad’s family owned a beautiful two storey brick terrace in Richmond with a long plot of land out the back. They cashed in for a stupid price in the 70’s and got themselves a new mortgage in Greensborough, which at the time was a new house and land package area. They’d have made millions if they’d held Richmond, but unfortunately that’s not the way people thought, or the areas that they valued back then. I suppose the biggest change between then and now is traffic, commuting time, cafe culture and cost of car ownership/communiting. We all value our time like never before and are happy to put a price on it.